0.09.18 09:08;Account;Receive;Received Payment 1.07 USD from account U18146067 to account U1294000. Batch: 227815501. Memo: API Payment. Withdraw to allhyips from AZAKUS LIMITED. 12.09.18 08:42;Account;Receive;Received Payment 1.07 USD from account U18146067 to account U1294000. Batch: 228064870. Memo: API Payment. Withdraw to allhyips from AZAKUS LIMITED. 13.09.18 07:18;Account;Receive;Received Payment 1.07 USD from account U18146067 to account U1294000. Batch: 228179466. Memo: API Payment. Withdraw to allhyips from AZAKUS LIMITED. 14.09.18 08:43;Account;Receive;Received Payment 1.07 USD from account U18146067 to account U1294000. Batch: 228308100. Memo: API Payment. Withdraw to allhyips from AZAKUS LIMITED. 7.09.18 08:41;Account;Receive;Received Payment 1.07 USD from account U18146067 to account U1294000. Batch: 228629111. Memo: API Payment. Withdraw to allhyips from AZAKUS LIMITED. 19.09.18 07:10;Account;Receive;Received Payment 1.07 USD from account U18146067 to account U1294000. Batch: 228880517. Memo: API Payment. Withdraw to allhyips from AZAKUS LIMITED. 21.09.18 11:25;Account;Receive;Received Payment 1.07 USD from account U18146067 to account U1294000. Batch: 229144796. Memo: API Payment. Withdraw to allhyips from AZAKUS LIMITED. 20.09.18 10:44;Account;Receive;Received Payment 1.07 USD from account U18146067 to account U1294000. Batch: 229027370. Memo: API Payment. Withdraw to allhyips from AZAKUS LIMITED. 24.09.18 11:06;Account;Receive;Received Payment 1.07 USD from account U18146067 to account U1294000. Batch: 229453949. Memo: API Payment. Withdraw to allhyips from AZAKUS LIMITED. 25.09.18 10:28;Account;Receive;Received Payment 1.07 USD from account U18146067 to account U1294000. Batch: 229571249. Memo: API Payment. Withdraw to allhyips from AZAKUS LIMITED. 6.09.18 10:23;Account;Receive;Received Payment 1.07 USD from account U18146067 to account U1294000. Batch: 229693115. Memo: API Payment. Withdraw to allhyips from AZAKUS LIMITED. 28.09.18 11:13;Account;Receive;Received Payment 1.07 USD from account U18146067 to account U1294000. Batch: 229930402. Memo: API Payment. Withdraw to allhyips from AZAKUS LIMITED. 01.10.18 11:16;Account;Receive;Received Payment 1.07 USD from account U18146067 to account U1294000. Batch: 230579776. Memo: API Payment. Withdraw to allhyips from AZAKUS LIMITED. 03.10.18 07:04;Account;Receive;Received Payment 1.07 USD from account U18146067 to account U1294000. Batch: 230796814. Memo: API Payment. Withdraw to allhyips from AZAKUS LIMITED. 02.10.18 09:58;Account;Receive;Received Payment 1.07 USD from account U18146067 to account U1294000. Batch: 230695249. Memo: API Payment. Withdraw to allhyips from AZAKUS LIMITED. 04.10.18 11:37;Account;Receive;Received Payment 1.07 USD from account U18146067 to account U1294000. Batch: 230941591. Memo: API Payment. Withdraw to allhyips from AZAKUS LIMITED. 05.10.18 10:06;Account;Receive;Received Payment 1.07 USD from account U18146067 to account U1294000. Batch: 231053352. Memo: API Payment. 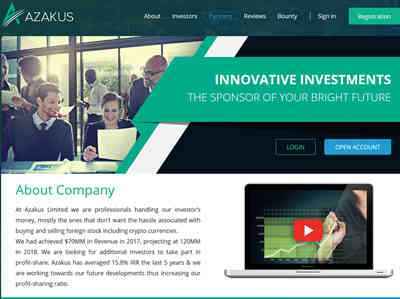 Withdraw to allhyips from AZAKUS LIMITED.